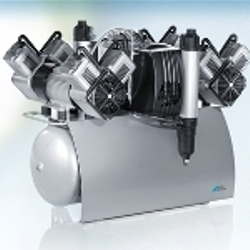 Quattro Tandem, the nonplus ultra in power for dental laboratories and large surgeries with a 90 litre tank, optionally with one or two units. For four (1 unit) or eight therapists. Unit for cleaning and care of handpieces and elbows, other sterilisation and laboratory equipment also required compressed air. This has to be added to the number of therapists.